Love the Arts? 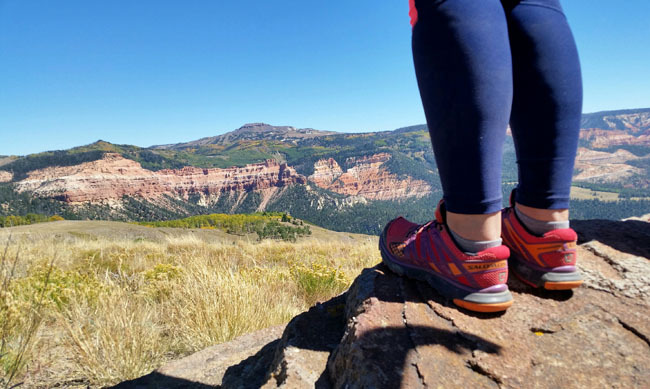 Plan a Getaway to Cedar City, Utah! This is a sponsored post for Visit Cedar City. The Maestro's first job after receiving his DMA (doctor of musical arts) was in Cedar City, Utah. During the three years that we lived in Cedar City, we were blessed to be able to participate in the rich tradition of the cultural arts there, as both performers and audience members. If you are an lover of the arts and want to expose your family to some wonderful artistic experiences, Cedar City (also known as Festival City USA) is a great choice for your next family vacation. 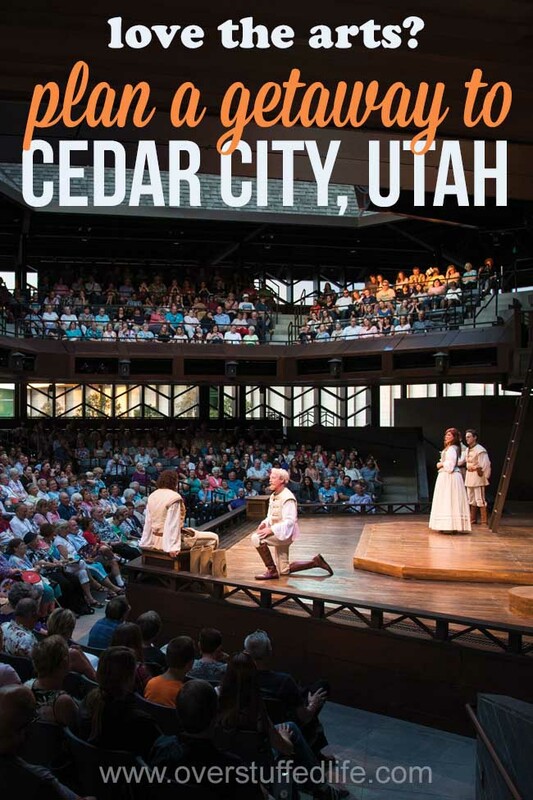 Not only are there many options too see great theatre and music, Cedar City is close to some of nature's most magnificent artistic creations, making it a prime spot for a summer getaway full of outdoor activities your family is sure to love. Utah Shakespeare Festival's 2016 production of Much Ado About Nothing. Photo by Karl Hugh, courtesy USF, used with permission. 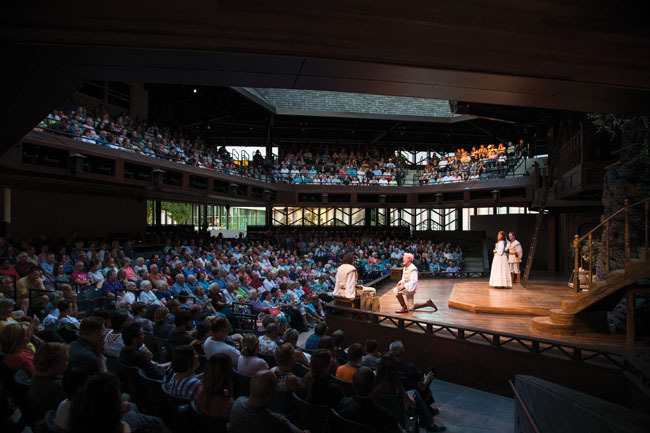 The Utah Shakespeare Festival is perhaps the most well known theatre experience in Cedar City. Each summer, people come from all over the country to see it—my aunt who lives in L.A. comes out faithfully each year, and there are thousands of others like her. While we were living there, we had the opportunity to see many of the plays put on by USF and they are of the highest quality. While the focus is on Shakespeare, there are always a few non-Shakespeare plays and musicals in the line up. The Maestro actually played trumpet in the pit for the USF 2008 production of Fiddler on the Roof—36 performances! All of the plays generally run from late June/early July through October. Find more information at www.bard.org, including the current line-up and educational materials to prepare you for your visit. 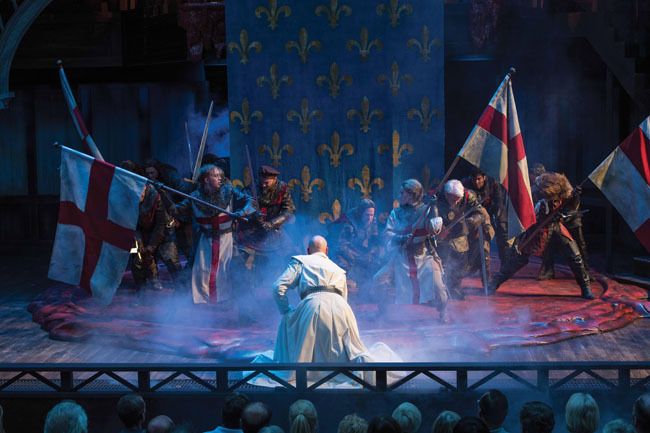 Utah Shakespeare Festival's 2016 production of Henry V. Photo by Karl Hugh, courtesy USF, used with permission. Last summer (2016), we had a family reunion near Cedar City, so all of the adults went to see Henry V one night. It was spectacular—and of course I expected nothing less from the Utah Shakespeare Festival. It was especially cool for us to see the play in the brand new Engelstad Theatre, which just opened summer 2016. It is an open-air space, much like theaters in the Elizabethan era, but has modern amenities and technology. Though the play itself would have been spectacular in any theater, the Engelstad made it that much better. See the video below for more views of the theatre and the festival itself. USF Shakespeare Greenshow. Photo by Alex Santiago, courtesy Visit Cedar City, used with permission. 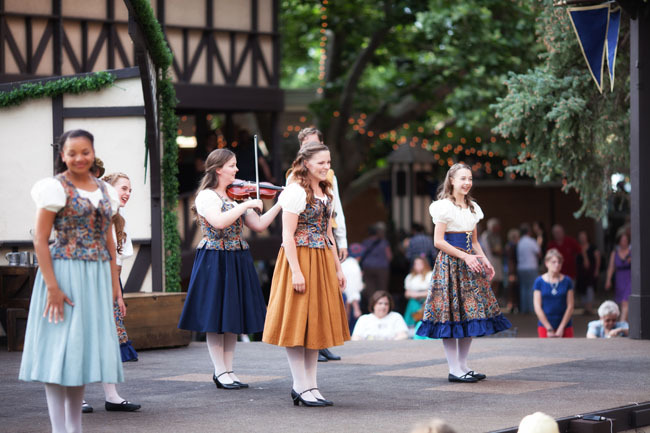 Each night before the plays begin, the Utah Shakespeare Festival puts on a greenshow. We went to the outdoor greenshow often with our girls, who were fairly young when we lived in Cedar City. (I blogged about it once, you can read it here and see a few of my photos: Shakespearean Greenshow). The Greenshow is free—simply bring blankets or chairs to sit on and set up on the lawn outside the theatre. There are three different shows which alternate each night, so you could go three nights in a row without seeing a repeat. There is music, dancing, and lots of fun to be had. While you're there, vendors dressed in Shakespeare period costumes will wander through selling tarts and other goodies. The Neil Simon Festival's performance of London Suite. Photo by Karl Hugh, courtesy Neil Simon Festival, used with permission. Also known as Cedar City's "other" theater festival, The Neil Simon Festival may not be as well-known, but it is certainly worthy of your time! 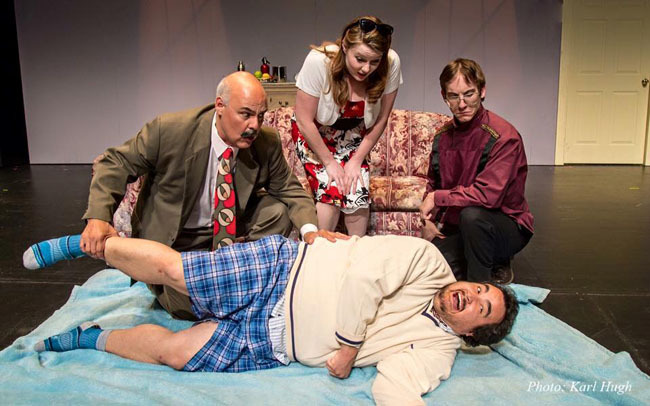 Dedicated to performing the plays of Neil Simon, there are generally four plays available to see each summer: two by Neil Simon, and two others. Our last summer in Cedar City, I got to be the music director for Neil Simon's Biloxi Blues, directed by my brother-in-law. I had a blast teaching the actors some of the famous songs from the 1940s which they used as scene transitions (see photo below). I saw almost every play at this festival during the three years we were there, and can say that they were all very well done, highly entertaining, and fun for the whole family (though you may want to check synopses if you're planning to take your children, Simon does handle mature themes occasionally). 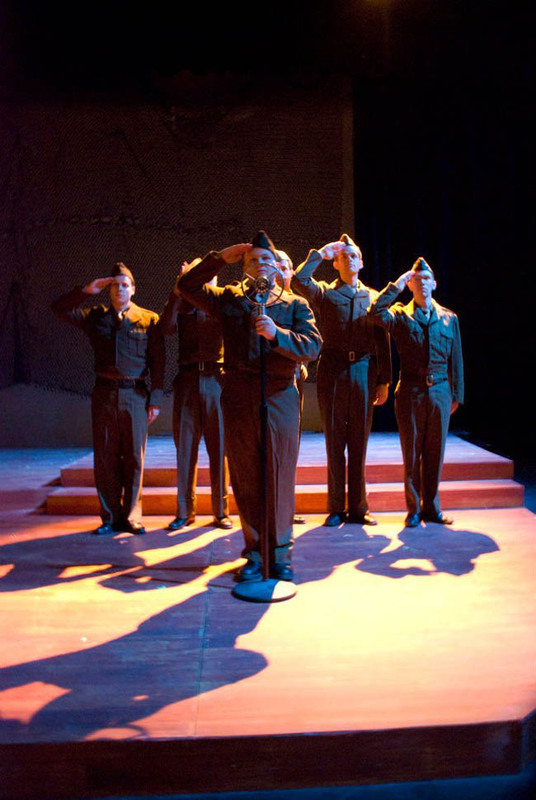 The Neil Simon Festival's 2009 production of Biloxi Blues. Photo courtesy The Neil Simon Festival, used with permission. The Neil Simon Festival runs for a month in July/August of each year. Find more information at www.simonfest.org. 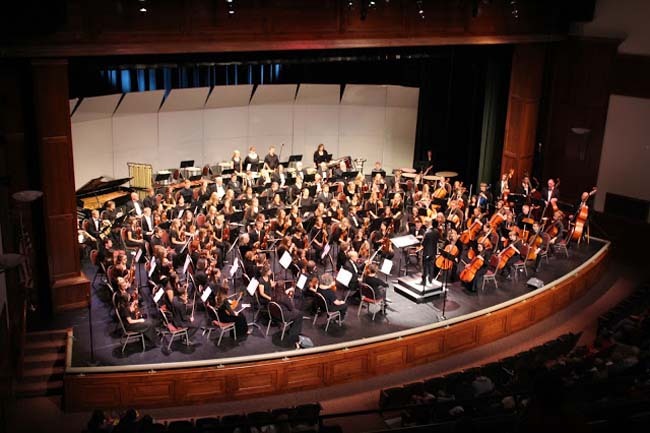 Orchestra of Southern Utah. Photo courtesy OSU, used with permission. During the three years that we lived in Cedar City, The Maestro served as assistant conductor of the Orchestra of Southern Utah. We were highly involved with the organization in many different ways. The orchestra is quite good and always has interesting programming. If you love classical music and plan a trip to Cedar City during the orchestra's season, make sure to get a ticket. The season begins in early September (while the Shakespeare Festival is still in session) and ends in April. Visit orchestraofsouthernutah.org to see the current season and find ticket and venue information. Southern Utah Museum of Art at Southern Utah University. Photo by Joanne Brittain, courtesy Visit Cedar City, used with permission. 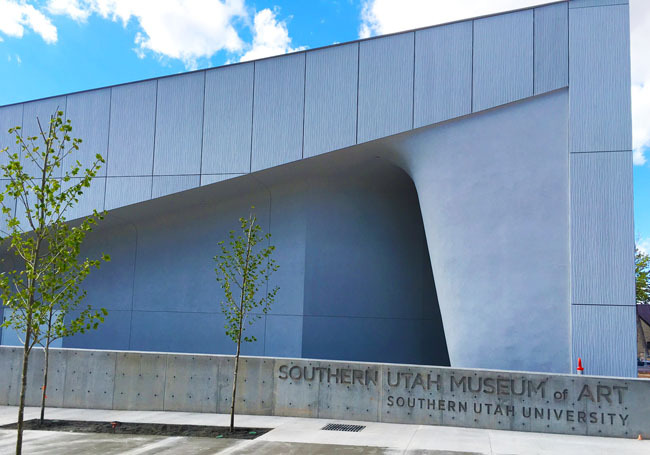 The Southern Utah Museum of Art is a new installment on the SUU campus (near the Engelstad theatre). When we were in town last summer for our family reunion, we were able to walk through it a bit, and I was impressed. Not only are the exhibits beautiful, the building itself is intended to be art itself—it is a sculpture that is fascinating to look at! Petroglyphs at Parowan Gap. Photo by Alex Santiago, courtesy Visit Cedar City, used with permission. 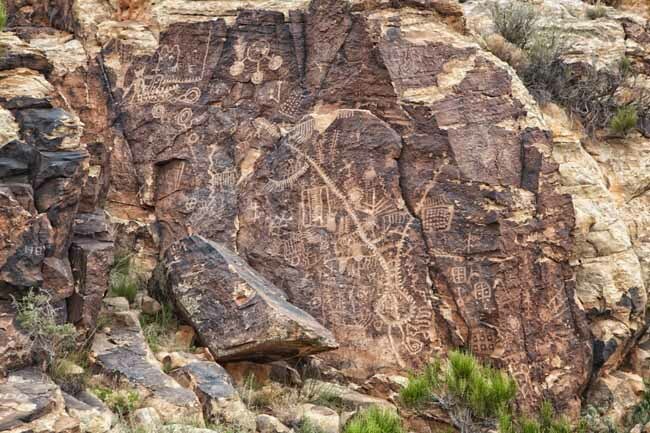 Ancient native American art can be found just north of Cedar City at Parowan Gap. Combine hiking with art and get a fascinating look at the petroglyphs which were most likely made by the Parowan Fremont. This was something I never did get around to doing, but someday I will! My children at Lion's Mouth Cave circa 2008. While the petroglyphs are carved into the rock face, pictographs are painted onto the rock. 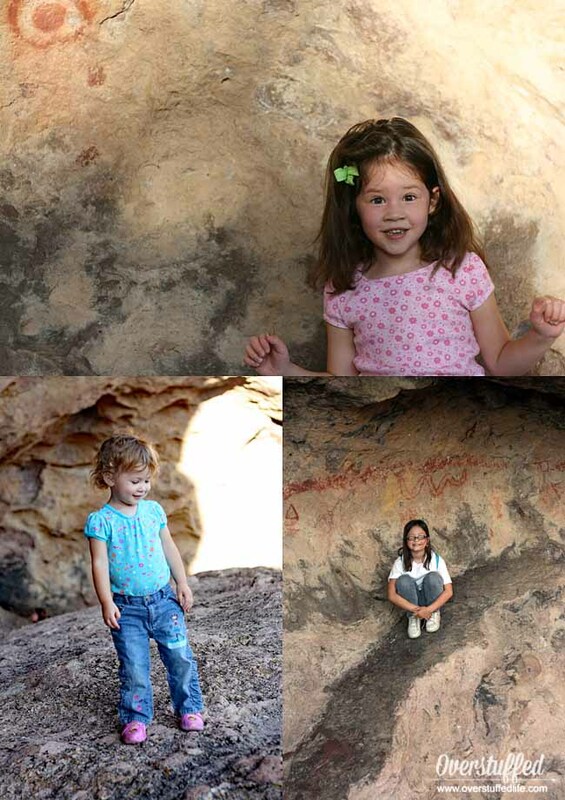 Just west of Cedar City, you can find Lion's Mouth Cave which has many native American pictographs. This is a very kid friendly hike (nature walk more like)—we took our kids there once and had a great experience, and they were quite young at the time. Cedar City is a good central point for visiting The Mighty 5: Canyonlands, Arches, Capitol Reef, Bryce Canyon and Zion. The red rock, hoodoos, and other rock formations are magnificent and will leave you in awe! Family activities include hiking, biking, river rafting, mule riding, nature walking, and there are plenty of educational events at each park. My kids enjoy being part of the national junior park ranger programs and getting their passports stamped whenever we visit any national park, the Mighty 5 being no exception. 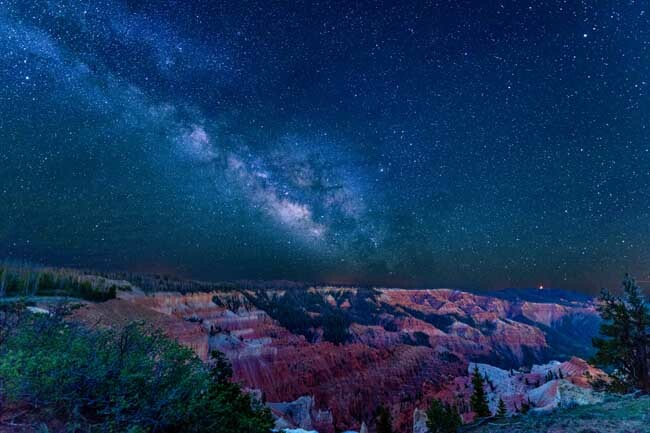 Cedar Breaks at night. Photo by Mike Saemisch, courtesy Visit Cedar City, used with permission. I think it's quite fitting that one of the most magnificent works of nature's art near Cedar City is Cedar Breaks—a geologic amphitheater. There is hiking and camping available at Cedar Breaks, as well as several cool activities. There is a summer star party each Saturday during the summer that takes you on a laser guided tour of the night sky with the telescopes at the park. They have plein air art events, and the art that is created during that time will be displayed at the Southern Utah Museum of Art. There are also several educational events to take your children to where you can learn about the wildlife in the park. Brian Head ski lift. Photo by Mike Saemisch, courtesy Visit Cedar City, used with permission. 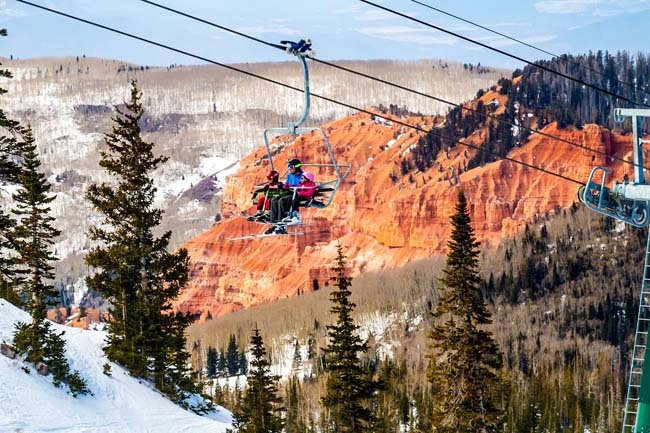 Brian Head is just north of Cedar City and offers great skiing and other snow sports in the winter, and some amazing hiking in the summer. I will never forget doing a hike at Brian Head—a difficult one—and thinking I wasn't going to make it up to the top. But as soon as I did make it to the top, the amazing sight before me made the difficulty of the hike more than worth it.